How can you spot the difference between an office with high-speed connectivity from a location where tenants are struggling with dropped signals, poor conference call quality, and unreliable internet connections? At WiredScore, our goal is to provide transparency into what is going on behind the walls in your workspace by making comprehensive connectivity data readily accessible and easy to understand. That mission to drive transparency and access to critical connectivity data for real estate professionals is why I'm excited to share the news about our newest partnership with CompStak. Effective immediately, data about Wired Certified buildings is available on CompStak’s Enterprise and Exchange platforms. Now, when users are analyzing transaction and property-level data, they’ll have transparency into an important building attribute that’s impacting asset value: digital connectivity. The increased visibility of Wired Certification on CompStak’s platforms shines a spotlight on the importance of digital connectivity in office properties. With this insight, CompStak’s users can instantly measure whether a property is positioned for a rapidly evolving, tech-forward workforce, compare its connectivity to its peers, and gain insight into whether the building ownership has taken steps to maintain asset value by investing in digital connectivity. Increasingly, the digital readiness (or obsolescence) of office properties is considered a factor for investors and tenants when evaluating office properties. Information about a property’s Wired Certification, synthesized with historical transaction data and property details, will help CompStak’s users determine property value says Co-Founder and CEO of Compstak, Michael Mandel. 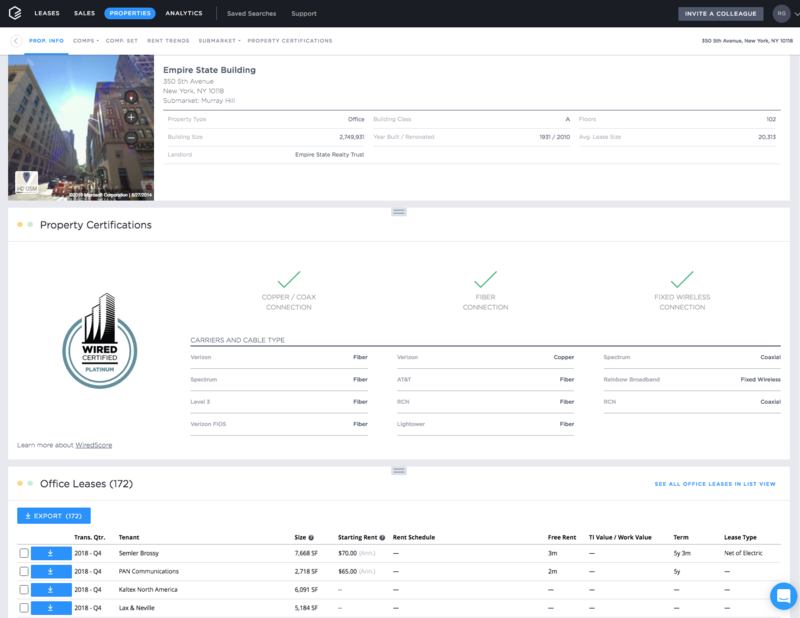 “Our members and clients rely on CompStak to track lease and sales transactions, and to leverage that data to underwrite investments and loans on commercial real estate assets. Key to understanding the value of a property is combining this transaction data with robust property-level data,” Mandel, commented. As part of the new integration, Wired Certification levels (Platinum, Gold, Silver, or Certified) and key details from Wired Certification fact sheets will flow directly into CompStak’s property reports for all users to access directly on the platform. These reports include insight into the quality and type of digital infrastructure as well as the carriers that can service tenants in the building. “The digital connectivity of an office building is a key driver of its value, and we’re thrilled to be able to provide this insight to our members and clients by presenting WiredScore’s Certifications, the industry standard in connectivity data,” added Mandel. This new partnership follows WiredScore’s $9 million Series A raise in October 2018 and the expansion of the Wired Certification standard across North America and EMEA, driven by an influx of commercial real estate firms prioritizing investment into their digital connectivity strategies. Arie Barendrecht is the CEO and Founder of WiredScore. Wired Certification launched in September 2013 as “WiredNYC,” and has since expanded across North America, the United Kingdom, and Europe.